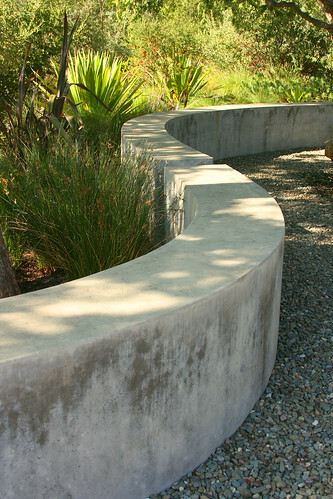 Our group started out our Peninsula garden tours with a stop at Bernard Trainor's well-published garden with curving concrete wall and wide spilling water feature. I was really happy to get to see this garden after seeing so many photos of it. 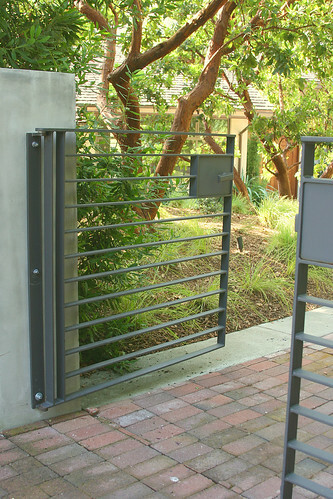 We entered through some well-made steel gates. The house itself was very beautiful. 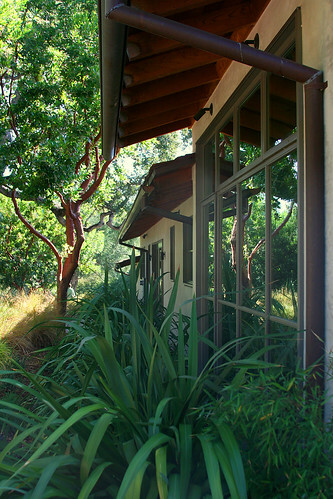 The large windows reflected the garden nicely. 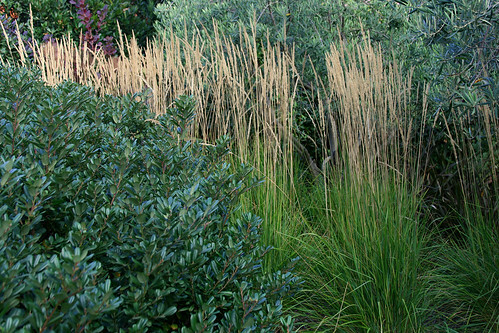 The front garden has groves of Arbutus 'Marina' which are underplanted with swaths of mounding grasses. Apparently they have had trouble with dieback on some of the Arbutus 'Marina'. 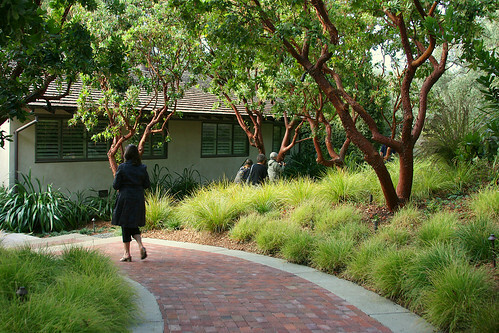 It is a hybrid tree with one of its parents being the notoriously hard-to-grow Arbutus menziesii, from which it gets its pretty red peeling bark. Arbutus 'Marina' is a good bit easier to grow than A. menziesii, but I guess it still can have issues from time to time. 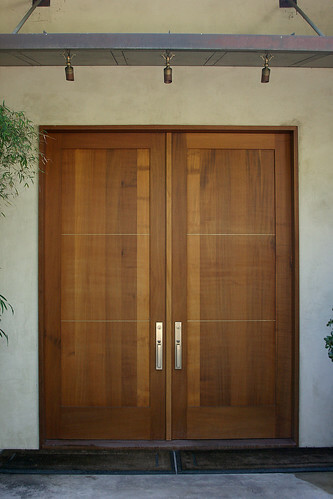 Check out these fantastically gorgeous front doors. 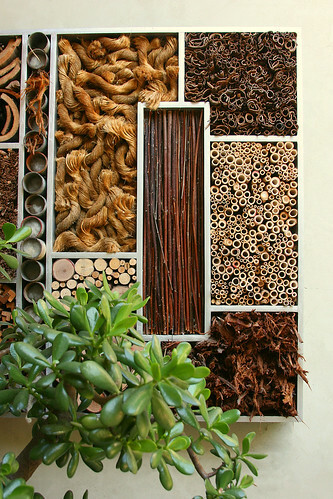 Also in the front entry is an insectary from Flora Grubb. 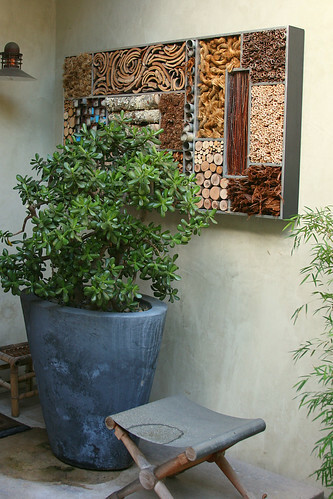 I'm curious about how these expensive bug houses will age. How long will they look good? Will the owners still keep them around as the bugs that they were made for inhabit them? 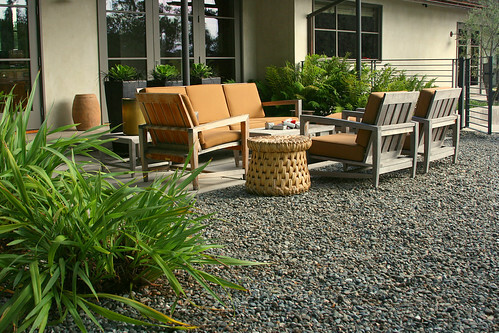 They will inevitable look unkempt with cobwebs and broken down organic material as the bugs start to use them as homes. I kind of doubt people will want them next to their front doors then. The path continues around the side of the house. I like the way the red in the stone picks up the red bark of the tree trunks. 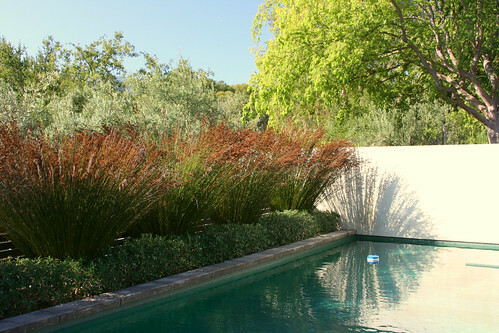 The plantings are a study in muted simplicity. 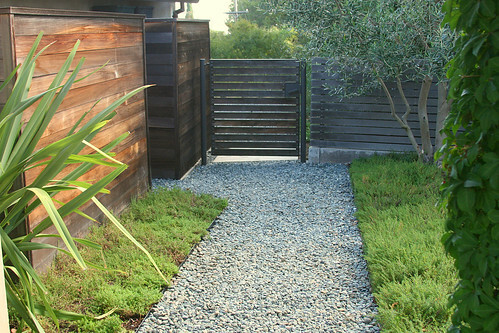 I love gardens that use a subtle color palette. 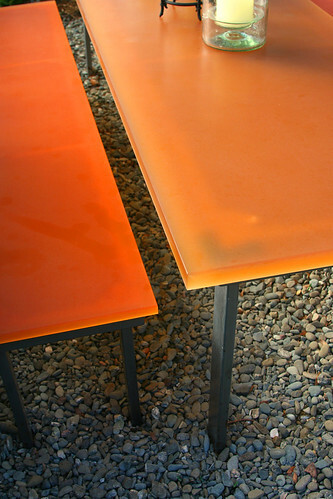 I find it very relaxing, with the interest and excitement found in the combining of textures and shapes. 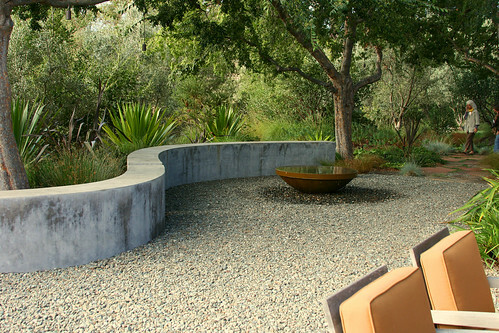 The back patio is surrounded by the well-known curving concrete bench. 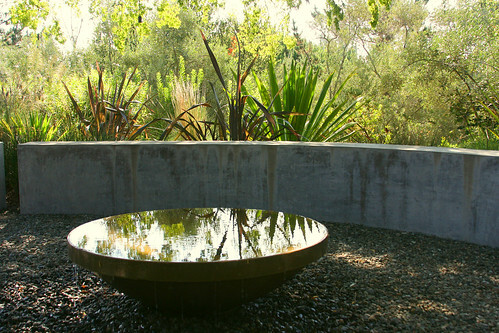 In addition to the relaxing plant palette, the slowly overflowing water basin gives a sense of peacefulness to the space. 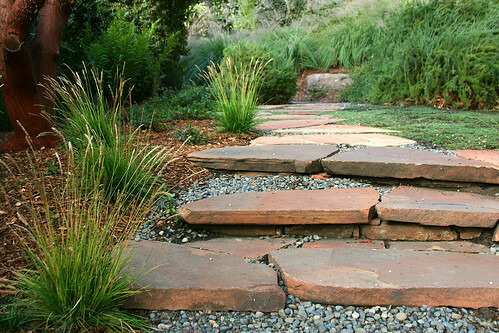 I love the crunch of gravel underfoot, which naturally slows one down as well. 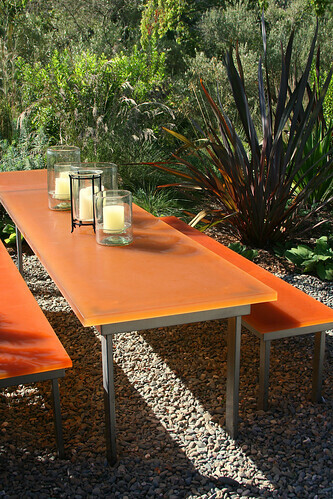 The resin table and bench add a nice pop of color. 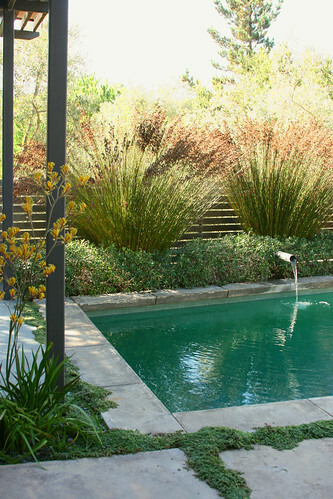 A nice transition from the house leads one to the simple rectangular pool. 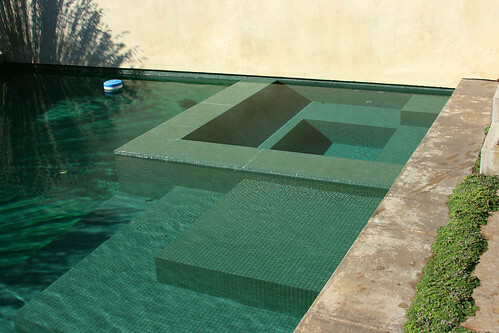 I love the detailing, especially how the spa fits into the shape of the pool. 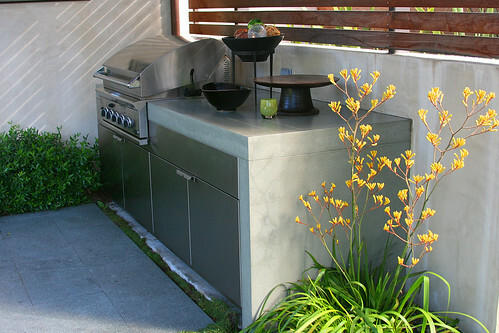 Past the outdoor kitchen is the attractively screened utility area. 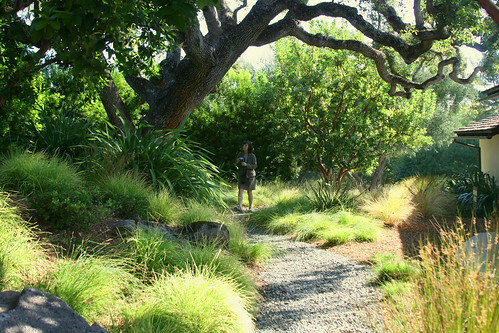 Walking around the other side of the house leads you under a beautifully branching oak to complete the garden tour. A very lovely garden, I was so glad to get to see it in person. So glad you got to see this garden too. Stately, serene, contemplative, is what I'm seeing through your wonderful photos. Wow! What an experience and such a stunning garden. 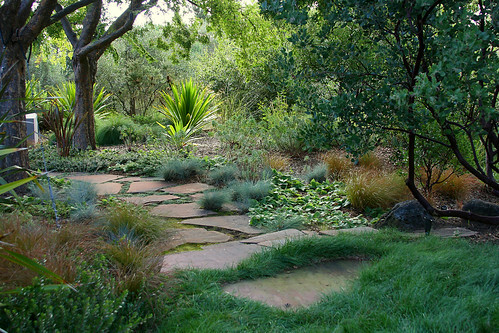 I normally don't think much of gardens that are lacking in plant diversity, but there's so much visual appeal in the strong lines and exquisite bones Bernard Trainor focuses on. 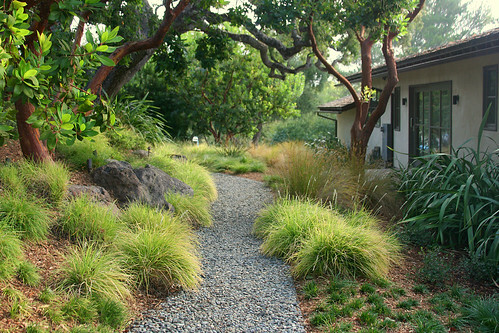 Just the way the light illuminates the stunning Arbutus and emphasizes the texture of the grasses is brilliant. I appreciate the last photo with the person there for scale! what a lovely garden !!!! 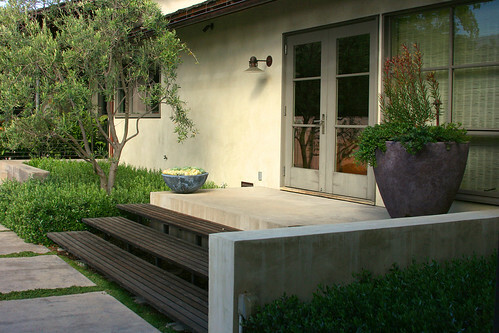 Like Riz said, the massing of plants to emphasize line and form is very well done. Thank you for these beautiful images of a very lovely garden. Wonderful blog and photos. Wish I was there. The detailed information on your tour is very helpful and the supporting photos are outstanding. I am always looking for design ideas. This was great, thank you for sharing. Wow, that is a truly amazing garden!! I would love to live there! Those bug houses look like works of art, they are gorgeous! But I bet you're right, they will be replaced as soon as they start looking used.